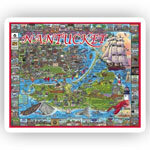 Poster of Nantucket. This far away island, as the Indians called it, lies 25 miles south of Cape Cod in Nantucket Sound. Before 1850, it was the greatest whaling port in the world. With its cobbled streets and elegant homes, Nantucket Town is an American treasure. Some vacationers consider this 14-mile-long glacial moraine the most beautiful spot on earth. Poster measures 25� x 35�.